The old forum used to have a similar thread - really handy stuff. Well, maybe someone starting out on a small budget can benefit. First there are the essentials that every free-bie junkie should have; Gimp, Sculptris, Poser Debut (is it still free? ), Blender, - these are easily found by Googling. Those are extremely powerful tools used in pro league and now is accessible to everyone in Lite versions while Lightworks pro version is a true bargain. I loved FolderSize, pity it doesn't work in Win7. pity it doesn’t work in Win7. Ah, different FolderSize. The one I meant integrates with Explorer and lets you replace the Size column with Folder Size. No, didn't know about that one. And don't forget about good old http://www.giveawayoftheday.com/ ! Free licensed software daily. Got some real gems there. Gotta check every day! It's mostly useless garbage - but they do graphics software periodically. Worth the time to look daily. Topmod.........may not make life easier, but sure is interesting! 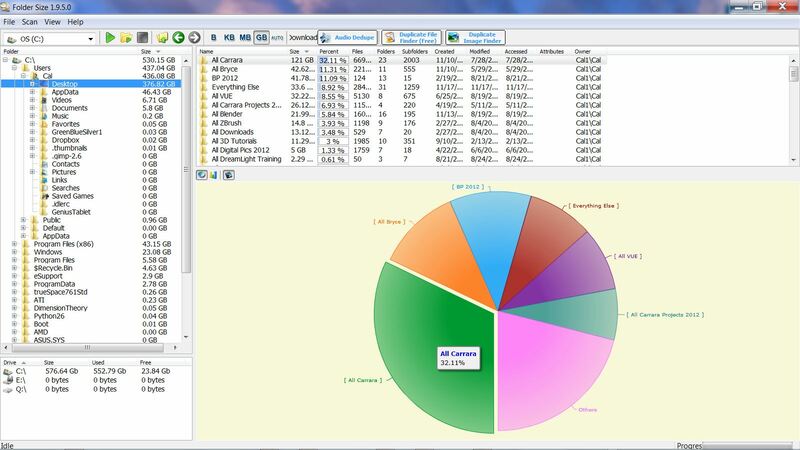 WinDirStat looks interesting......very colorful, almost 3D....more info at a glance. thanks for the DEMs apps links.........still trying to get a realistic Martian landscape. cdordoni I know this is a thread in the Carrara forum, but do any of those DEM apps also work with Bryce, do you know. Pretty please. They should work with Bryce as well. I think to find out which formats work the best is a matter of trial and error, so be prepared to have some patience. I don't believe DEM works directly in Bryce, certainly not in Carrara. Use Wilbur to convert DEM to height-map and it'll work in any 3d app that does height-maps. this is great mind mapping software. Great for writing, planning a big project or even linking to images. It's main advantage is that ideas are mapped out in an image format., as opposed to a linear, down the page approach. There are so many terrain or DEM formats its hard to keep them all straight, and remember which apps can use a specific format. The 8-bit heightmap is supported in almost all 3d apps. To reduce the stairstep effect, 16-bit heightmaps are better, if the application can read and use the 16-bit data. Probably everyone already has this, but just in case! For content creation, cleaning up clumsily executed free files, batching mats out of one shader, or absolutely any other text editing function, Notepad++. I can't count the number of times this has saved my bum when it came to fixing incorrect references in an entire tree of subfoldered files - for basic or advanced text editing this thing is incredible.